Joe Gormley in Peterborough United colours. Pic by PressEye Ltd.
Peterborough United have confirmed that Joe Gormley will return to play football in Ireland. Whether that is in the Irish League or the League of Ireland remains to be seen, but speaking on the club’s Youtube channel, Peterborough’s Director of Football Barry Fry confirmed that Gormley will return home. Gormley, who was on loan at St Johnstone, has written to FIFA to get his contract cancelled, as have Peterborough and St Johnstone. “It’s just one of those unfortunate things. The most important thing is Joe’s health, his state of mind,” said Fry. Our sister website, Peterborough Today, earlier posted news of Gormley’s decision to “quit professional football” having “failed to settle in England or Scotland”. Gormley was back home in Northern Ireland last weekend watching the Danske Bank Premiership game between Ballymena United and Ballinamallard United. Gormley moved across the water in the summer of 2015. Registration rules would restrict Gormley’s playing options until next season. 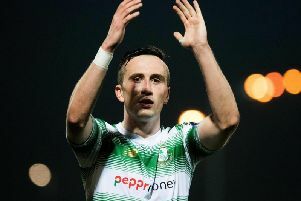 He has made appearances for Peterborough and St Johnstone in the current campaign and cannot play in the same year for more than two clubs.